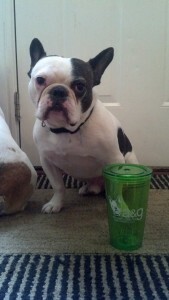 Get a Hugo cup with a $1 donation to GHAM! Visit a&g mascot, Hugo the Frenchie, and his Frenchie Kissing Booth at the third annual Dog Days of Summer event to benefit Greenfield-Hancock Animal Management. The event is Saturday, August 17th, 2013, from 10am-3pm at Riley Park in Greenfield. It is free, family and dog friendly and over 50 dog friendly vendors, animal rescue groups and animal demonstrations are expected to attend. In addition, low cost rabies shots and micro-chipping will be available. Food vendors will also be on hand with fair-style food and beverages available for purchase. Stop by the a&g booth where Hugo and his Frenchie brother, Bronx, will be giving out kisses for a $1 donation to Greenfield-Hancock Animal Management (GHAM). In addition, anyone who makes a donation to GHAM will receive an a&g tumbler. Our friends from Action Air Heating and Air Conditioning will also be volunteering in the booth and has graciously offered to kick off the donations with a $100 check. Is Your Website Relevant in the Search Engine’s Eyes? Angie Commorato is a web marketing consultant, based in Indianapolis, IN, offering search engine optimization, social media marketing, web design, paid search management & email marketing. To contact her, send an email to Blog@Commorato.com.